When thinking about the many great applications for promotional travel mugs one can not look past sporting events. Sporting events and promotions for sporting events are an ideal place to utilise personalised travel mugs. They are a great gift for many reasons and will be sure to impress your customers. Who amongst us has yearn for a warm cup of coffee whilst watching our favour football, cricket of soccer team play in the middle of winter. Even in summer you can substitute your warm coffee with a travel mug full of cold tea. A good mug not only keeps liquid warm it also keeps it cold. We have a large range of promotional travel mugs available which are all great depending on your branding needs. The metal travel mugs are great for printing but can also be laser engraved. The laser engrave is durable and looks great. 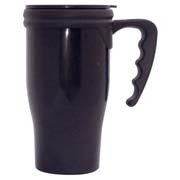 We also have plastic travel mugs which can be screen printed and come in a variety of colours. Can be used with both cold and warm drinks. Can be laser engraved or screen printed. So what are you waiting for? Call Ezymugs today for your next promotional travel mug campaign.